Five horses from Kip Elser’s consignment will gallop up to the sale. 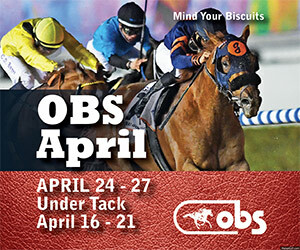 When the under tack workouts take place March 26 for horses entered in the Fasig-Tipton Gulfstream selected sale of 2-year-olds in training, don’t look for any of the entries from Kirkwood Stables to be doing a quick eighth-mile or quarter-mile down the lane. At the behest of a client, the Kirkwood horses will gallop during workouts for the March 28 auction that will be held in the walking ring at Gulfstream Park in Hallandale, Fla. Monday’s under tack show begins at 9 a.m., and Wednesday’s sale starts at 3 p.m. (all times Eastern). Kip Elser, who operates South Carolina-based Kirkwood, said the idea for the unique approach to showcasing his young horses’ abilities came during a conversation at Saratoga in August. Elser said “Gulfstream Gallop,” the name under which the Fasig-Tipton sale juveniles were purchased, is designed to offer an alternative to the traditional methods of evaluating racing prospects. As 2-year-olds in training sales have soared in popularity—and sellers have become adept at getting their horses to go fast during the under tack shows—juvenile sales have, in some cases, become the end-all rather than a means to the end. “We have created this situation ourselves. Consignors have gotten better and better at getting horses to go faster, but what has happened is that the preparation for a 2-year-old sale is no longer a part of the process of getting them ready to run. It is a very different process,” the horseman said. “Theoretically, a 2-year-old sale should be a stop on the way to their first start. For some, it is the end of the process rather than a step along the way. Elser said buyers can have confidence the Gulfstream horses are galloping as part of a long-range plan, not because they have shown an inability to go fast. This is not the first time Elser has brought outside-the-box thinking to his sales approach. Kirkwood had horses gallop at juvenile sales when Elser was representing Seth Hancock and Claiborne Farm. Also, Kirkwood was one of the first North American operations to sell 2-year-olds in England, and it established a foothold in the South African 2-year-old sales sector. “That is part of where this game will take you, if you let it,” Elser said. 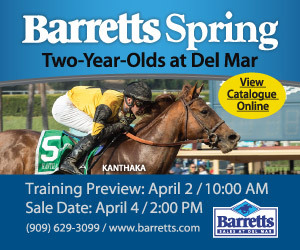 Other consignors, most notably Frank Stronach’s Adena Springs operation, have showcased 2-year-olds in training by only galloping them in advance of an auction. Hip 2, a Noble Mission colt from the female family of multiple grade 2 winner Lewis Bay. The colt’s half brother, Yulong Warrior, recently won a stakes race in the United Arab Emirates. Hip 26, a Data Link filly whose extended female family includes prominent broodmare Toll Fee. Hip 88, an Exchange Rate colt from an active female family that includes multiple grade 3 winner Sailors Sunset. Hip 136, a Liaison colt out of a stakes-placed Pine Bluff mare who is from the family of multiple grade 1 winner Both Ends Burning. Hip 137, a Blame filly from the female family of 2001 Breeders’ Cup Juvenile Fillies (G1) winner Tempera.